Helping our clients understand, interrogate, analyse and present the complex clinical and economic data available to them in a simple manner, linked to the overall product value proposition, has never been more important. 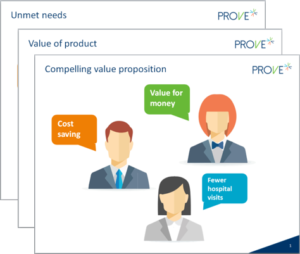 Development of value propositions, underpinned by scientific evidence, is at the core of what we do. We are able to provide critical insights to define and build credible, differentiated value propositions and communicate compelling payer evidence. Throughout the product clinical development and launch stages, we support clients through development of value propositions and messaging, core value dossiers, HTA submission documents, payer relevant publications, advisory boards, internal workshops and training sessions. We also work with our country partners to access comprehensive payer networks across all major markets and regions including the EU7, Canada, Australia, the US and China. These payers have either been actively or recently involved in the pricing and reimbursement process at national, regional and local level and can therefore provide strategic payer insight to inform client projects. We can also provide opportunities to engage with payer experts to co-create solutions to meet specific challenges. We also recognise that high quality and effective medical writing is one of the core skills underpinning our expertise throughout the team. Our value analyst team are all trained in writing skills. In addition to core deliverables such as global value dossiers we develop supportive publications (manuscripts, abstracts and posters) to communicate the evidence and provide citable sources to support the value proposition.